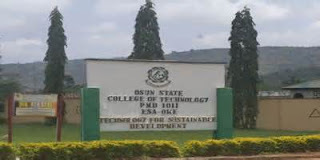 Osun State College of Technology (OSCOTECH), Esa-Oke Daily Part-Time National Diploma (ND) and Higher National Diploma (HND) Programmes Admission Form, Courses, Admission Requirements, Application Fees, Guidelines for 2018/2019 Academic Session. Applications are invited from suitably qualified applicants for admission into the underlisted Daily Part-Time academic programmes at both National Diploma (ND) and Higher National Diploma (HND) which would be available in the institution during the 2018/2019 academic session. Minimum of four (4) credit passes at not more than two sittings in requisite subjects in GCE ‘O’Level or SSCE of WAEC or SSCE of NECO or NTC of NABTEB. National Diploma (ND) with a minimum of Lower Credit in the course/programme of choice and four (4) relevant credits including English Language and Mathematics at the GCE ‘O’ Level or SSCE of WAEC or SSCE of NECO or NTC of NABTEB. Candidates are advised to visit the College’s website (www.oscotechesaoke.edu.ng.) to avail themselves of the requisite entry requirement for the ND of each programme that make them prima-facie qualify for the Higher National Diploma (HND) programmes. A minimum of at least one year post-ND industrial work experience.